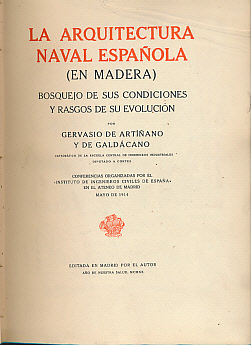 Barter Books : de Artiñano, Gervasio : La Arquitectura Naval Española [En Madera] Bosquejo de Sus Condiciones y Rasgos de su Evolución. Signed limited edition. 320 x 230 mm (13 x 9 inches) - 427pp, + illustrations. G+ : in Good condition plus without dust jacket. Spine soiled. Cloth frayed. Pages 397- 400 lacking, but appear never to have been bound in. Cruising Association library with embossed gilt stamp on front cover and symbol on spine and label on paste-down. Some occasional light foxing otherwise contents VG.